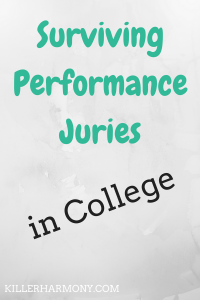 So, you are probably wondering what exactly is a jury and why do music majors have to deal with something we normally equate with a courtroom? Well, my friends, a jury is the word used to describe a final playing exam for applied music lessons in college. Just as with music theory, music history, and your general education classes, your lessons have a final. The specifics will vary from school to school and from professor to professor as far as what is required. As always, check with your school for specifics on what you need to know. I am here for the more general stuff. Here are some common questions you might want the answer to on juries. When do you take your jury? Juries happen during finals week, the specific days will be determined by your area of study. For instance, last semester at my college, Woodwinds had juries on Tuesday and Wednesday, Voice was Monday and Thursday, etc. the faculty got together and set the schedule for the week. Obviously in the music building somewhere, but it might depend on what the faculty need, what you as a student need, and what room is available. My juries happen in the recital hall of my college’s music building. Do you have to take your jury at an assigned time? Not necessarily. While you might have to stick to a specific day or two, professors realize that you have other finals that do have assigned times. The way my music department does it is they put up a sign up sheet a few weeks before juries so that you can look at your schedule and find what works. Just make sure that if you need an accompanist for your jury that you schedule to play when they can be there. What do you play in a jury? It can vary depending on your level of skill on the instrument, but usually some solo repertoire with piano (or without). If you have not passed all of your scale tests, you might be required to play scales either at the same time as your solos or during a different time slot. Check with your applied instructor. Any other tips for preparing for a jury? Give yourself enough time to practice your pieces. If you haven’t had your pieces all semester, it will take more time now to get to the level you need for performance. Also, try to schedule your jury so that both you and your accompanist are available about 30 minutes before hand. This way, you can run through the music one last time in a practice room before you have to do it for real on stage. What other finals do you have to take that are specific to music majors? For the first two years or so of college, you will have to take both music theory and ear training/sight singing classes. You will probably have finals in these, and they can be difficult, but are not that bad. Music history is another one specific to music. Other than that, it’s mostly just your general education classes that will have finals. Do ensembles have a final? My other tips: As with any class, it is important to give yourself enough time to study and prepare for exams ahead of time rather than waiting until the last minute and then having to cram. I don’t really tend to procrastinate so maybe it’s easier said than done, but it is so worth it. Sleep is invaluable during finals week. Don’t pull all-nighters. I’ve been in college almost three years now and not once have I pulled an all-nighter. If you plan your time right, you can get through finals (and an entire semester) without having to go a night without sleep. I don’t know about any of you, but I am quite the picky eater, like really picky. I like things plain. Turkey sandwiches? Just turkey and bread. Salads (when I’m feeling healthy)? Just give me spinach and maybe some broccoli. Pizza? Just cheese, please! The thing is, these sorts of options are not always available in the college cafeteria, at least at my university. Lately, my university has been promoting the main cafeteria over its other options: a coffee shop and a food court. But the thing is, my school is not exactly making their cafeteria very diverse or picky-eater-friendly. They probably think they are. There is a pasta and pizza bar, a salad bar, a sandwich bar, a soup selection, a grill with burgers and sometimes other things, and the main line with a nice entree and sides. Yes this is a lot to choose from, but it is not the most appealing thing to me. I like the cheese pizza, but now they seem to be making it more and more cheesy-and not cooking it enough for all of that extra cheese to melt. The pasta bar seems to always have some sort of pesto or fancy meat sauce: great for people who like that stuff, not so great for when you want just spaghetti and red sauce. The salad bar is an option, but I am actually not a fan of iceberg lettuce, and that seems to be all that is offered. When I see they have spinach out, I become the happiest person ever. The sandwiches are nice, but I always get strange looks when I say that all I want is turkey. And the peanut butter is just…weird. 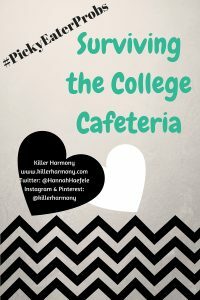 I could go on about how the cafeteria could be improved, but I want to share what I have learned to make the college cafeteria and the meal plan (usually required of on-campus residents) more bearable. 1. Keep food you do enjoy in your dorm room. If you don’t like the food that the cafeteria serves, keep some food you do like in your room. You probably can’t make five star meals, but get a microwave and fridge and get fruits, veggies, and other snacks to keep you full. If your dorm has a community kitchen that you can use, take advantage of it when you have the time. Invite your friends to a pasta night and make some spaghetti or fettuccine. 2. Look at your other options. Unless you are at a very small school, there will probably be at least one or two other options for on campus dining. At my university, we have a coffee shop and a food court with a grill, a Chipotle-esque place, and a sandwich shop, all of which are much better (IMHO) than the central cafeteria. Check to see if your meal plan can be used at these places or what you can do to utilize them. If you have no other options, or if the other options will cost you extra money, try and work with what you’ve got. Sometimes, I may not get a full salad, but I will go to the salad bar and get a plate of veggies. If I don’t think I will like the main entree, I might see what the side dishes are. Also, my cafeteria always has cereal out, so sometimes it might just be a cereal night. 4. Go for the experience. The college cafeteria, while somewhat terrifying, is unlike anywhere else. You probably have something that you can eat there, and even if not, go with your friends and keep them company. If it turns out nothing on the menu looks good, go get something to drink and talk with friends. You can always fill up on snacks when you get back to your dorm. Being away from home is difficult, and it certainly doesn’t help that the food is not the same as what you are used to. Try to make the best of it, but be prepared to have a back up plan. If the school meal plan is really that bad, see if you can get an exemption or move off campus and cook your own food. If that isn’t possible, use these tips to help make the experience of the college meal plan a little less scary. Hey sis. I know that you are stressing out. Junior year of high school and all. But you’re almost done. You only have a couple months left and then it will be summer. Your AP classes and exams will be done, and you will soon have two months of bliss and freedom to sleep late, stay up late, and binge watch all of your favorite shows. I don’t have much advice to offer regarding those AP classes, but I will say this. You are one of the smartest people that I have ever met. You have very informed opinions on the issues facing you, your family, and your community. Don’t let anyone ever tell you any different. I can offer you advice about some of the other stresses plaguing you now and in the months to come. First, take the whole college thing seriously. I regret only applying to one college, a college I didn’t even end up attending. I thought that I knew where I was meant to be, but I decided on community college which allowed me time to figure out where to go. I wish that I thought more into where to go to school. Take it seriously. Senior year is approaching quickly, and you don’t want to have any unnecessary stress. Try and enjoy your last year of high school. You might remember that I was a part time student and that I took some college classes. Try and take some college classes, if possible. I know your schedule will be busy, but at least take some classes that will prepare you for college. AP is good, but don’t forget to enjoy being a high schooler. I know you aren’t the biggest fan of that school, but one day, you might feel otherwise. Take pictures to help remember your Year of You. Have a productive summer this year. Yes, summer is supposed to be about taking a break from school and relaxing, so do that. Don’t forget that you still have a year of high school left. Do try and take a class or two over the summer. Do use the various online course websites, like Khan Academy, to keep up with things like math or to learn something that you don’t have time to take a class for during the year. Also, start organizing your college materials. Summer is the time to start categorizing schools. Trash the materials from colleges you know you would never attend. Make a pile for colleges that you might apply to, and make one for your top picks. This way, when you go to fill out applications, it will be a lot easier. You won’t have to stress as much because you will have already prioritized the different schools. Get your name out there at the schools you apply to. When it comes to after filling out your application, go online and look up the emails for the department heads of interest at the schools of interest. This way, you can introduce yourself (as much as possible through the Internet) and maybe ask some questions that you still have. This is good to do whether you did a campus visit or not, because you have time to think about how to best phrase a question and if you forgot to ask something during a visit, you can ask it now! Lastly, enjoy your time at home while you can. Our parents may be embarrassing, but they mean well, and they are very helpful. You don’t have to worry about doing your own laundry or cleaning up your general living space. You won’t have those luxuries in college, unless you stay local. Also, spend time with the family dogs and cat, because, sadly, they won’t be allowed in a college dorm room. 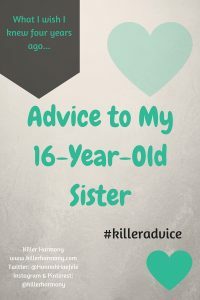 So sis, I hope these tips were helpful and maybe a little bit interesting? Don’t worry, you will be okay, no matter where you go or what you do. Everything will work out for the better. I promise. If you have any questions, don’t be afraid to ask. I’m here to help. I’ve done this college thing before. Thanks for reading, and let me know if you need anything else!